The results of the 2016 presidential election hit hard on Tuesday evening, Nov. 8. Growing up in Berkeley, Calif., progressive and liberal views are part of the air I breathe. Wednesday morning, I woke up in a trance and headed to my school, Berkeley High. I wasn’t sure what to expect. Berkeley High is notorious for its amazing student activists and student-organized protests in response to systemic problems affecting our community. If the election of Donald Trump is not rooted in dozens of systemic problems facing our country, then I don’t know what is. Upon my arrival, I was greeted with the booming, strong, united voices of my fellow classmates and friends, who were all gathered in the courtyard. Students and teachers were taking turns expressing their feelings about the election and leading the 1,500-plus students gathered in chants. For almost two hours, students who were gathered on the courtyard spoke, chanted, cried and found solidarity and comfort in each other, the Berkeley High community. After everyone who wanted to speak got a chance to do so, we all marched up to the UC Berkeley campus in a peaceful protest. Some teachers accompanied students, one even handed out snacks and sunscreen, as we were there for many hours. Here, we were joined by Cal students and passersby who were experiencing the same emotions as we were: fear, uncertainty, doubt, anger, betrayal and so much more. Adding my voice to a growing chorus of youth speaking out against all the racist, sexist, homophobic, Islamophobic, ableist values that this one man, elected president, seemed to embody was extremely moving and motivational. As usual, I was inspired by my peers to not stop there. I attended a community gathering a couple of days later. It was a post-election meeting meant to support our LGBTQ+ neighbors and see what they needed from the community going forward. The event was put on by the Bay Area Day of Remembrance Consortium and sponsored by the San Francisco chapter of the Japanese American Citizens League, Nichi Bei Foundation, Japanese Community Youth Council, Japanese Cultural and Community Center of Northern California and Nakayoshi Young Professionals. It was an amazing experience to speak in front of hundreds of people of all ages, races and genders about such important issues facing us all. The other speakers were extremely moving. One man talked about his experience responding “no” to both loyalty questions while interned. When I look back on the weeks following the election, I remember the dazed and terrified faces of my community members. I remember members of the LGBTQ+ community asking questions like, “Does this mean I should hurry up and get married?” I remember people telling stories of how they were driven off the sidewalk by a white woman in a truck while walking their dog shortly after the election. I remember turning on the news and hearing of a woman having her hijab pulled off her head. I remember my friends in tears and not knowing what to say to comfort them. I remember falling asleep with my mom in her bed because I was so afraid for our future — so uncertain. When I remember these things, I am reminded why we must never stop fighting for what we know is right, and when I remember the thousands of united voices of my classmates that day in the courtyard, I know we never will. 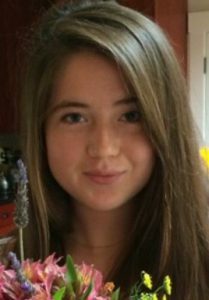 Amelia Huster is currently a senior at Berkeley High School and a board member of the Berkeley Chapter of the JACL. She would like to major in environmental studies or child development. Following is the speech Amelia Huster gave at the ‘United for Compassion: A Community Gathering Against Hate’ event that was held in San Francisco’s Japantown Peace Plaza. My grandma was born in Heart Mountain, Wyo., in an internment camp during World War II. I grew up hearing stories of the internment camp, stories of how my family was forcibly removed from their home, their farm, their life — their rights as American citizens violated as they were sent off to the most remote places in our country to be isolated from society. Here we are in 2016, and now I am not so sure. Because of our internment and our past, it is vital for the Japanese American community and every community to join together to protect the rights of our fellow citizens that are being threatened by hateful fear-based rhetoric, the same hate speech that we were targeted with. Whether it be Islamophobic talk directed at Muslims, sexism toward women, homophobia toward the LGBTQ+ community or racism toward other minorities. This is all language that is used in an effort to dehumanize our brothers and sisters. Unfortunately, we all know what this language looks like. I see it at Berkeley High, one of the most diverse, progressive schools in the nation. However, the results of this election are forcing us to talk about the most important issues that we thought we had made more progress on than we actually have. It is frustrating for me and many of my friends because we were not old enough to vote in this election, yet we will have to live in the world that it will inevitably shape. I know there is still hope because while the younger generation didn’t have a vote, we do have a voice, and we have been using it and intend to keep using our united voice throughout these next four years to stand with and fight for our fellow citizens. Berkeley High School has already made national news when over 1,500 students walked out to protest the election results, and you better believe we will not stop there. So, when we see someone being harassed, we need to stand up. We need to call people out, question hateful speech that we may hear. I know that it can go against people’s natural instinct to be assertive, to be pro-active in our day to day, but we need to have each others’ backs because we are always stronger in numbers. From a student’s perspective, in many classes at Berkeley High School, the curriculum is being shifted to focus on the result of the election and how we got here. In my economics class, we’re looking at where we are on the business cycle and thinking about employment. In my Chicano Latino literature class, we’re focusing on immigration reform. In my law and social justice class, we’re reviewing our rights and analyzing landmark cases like Roe v. Wade. America is going to have educated, aware youths who will soon become adults that will hold positions of power and influence. We are the next lawmakers, teachers, journalists, politicians. Our future is still bright. I am not giving up hope, and I encourage all of you to not give up hope either.